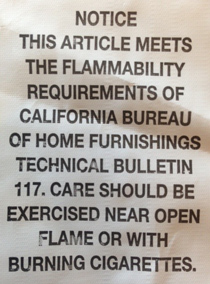 Common furniture items that contain polyurethane foam and meet the California flammability standard (TB 117) will likely be treated with flame retardant chemicals. You can inspect furniture in your home and look for these labels. Examples of furniture that are often treated include sofas/couches, loveseats, recliners, and padded chairs. Some infant products are considered juvenile furniture and meet this standard, including car seats, infant sleep positioners (wedges), high chairs and portable crib mattresses. If you have any of these items and would like to know if the foam inside these products is treated with flame retardant chemicals, you can submit a small sample (the size of a small marble) of the foam to us for testing. Please limit your submission of samples to no more than 5 items per household. 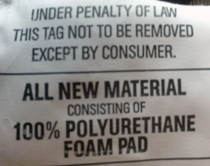 Some products, including child car seats, contain styrofoam filling. Some furniture can be filled with polyester filling instead of polyurethane foam. To our knowledge, most polyester filling is not chemically treated. Please do not submit samples of polyester filling for testing. Look for labels indicating what type of filling is in your furniture product before collecting a sample for testing. Polyester filling is typically white and is a woven and puffy thread-like material which often looks like cotton.